Very few business activities can be accomplished today without one form of technology or the other. Software has indeed become a critical aspect of our personal and professional lives. This article highlights the software tools a business analyst would typically use on the job. · Preparing UML diagrams such as use case, activity and sequence diagrams. · Preparing process flow charts. · Creating architecture diagrams, among other functions. Visio is easy to use and provides features for creating templates, applying themes and embedding models in other documents. Visio is only one example, however. 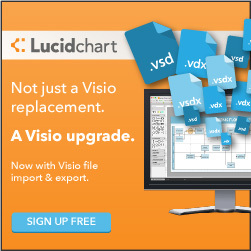 There are loads of diagramming software in direct competition with Visio, like Lucidchart. Check out A Business Analyst’s Review of Lucidchart. Microsoft Word is another important and popular software application in the business analyst’s toolkit. For organizations not ready to acquire Requirements management tools, Microsoft Word can be used as a substitute for preparing requirements specification documents. You can create new templates using Microsoft Word or use existing templates for the documentation of software requirements. Microsoft Word allows you to set preferred fonts; apply your company’s theme; embed external objects such as Visio diagrams or Excel worksheets; create visuals and track changes where collaboration has taken place. When you require any kind of data analysis on the job, spreadsheet applications like excel can come in handy. If you want to create pivot tables; examine trends in data; sort and filter data; create charts or graphs, Microsoft Excel can fulfil that purpose and more. Excel provides many built-in mathematical and financial functions that can aid analysis. Many a time, you will be working with stakeholders who need more than requirements specification documents or use cases. You need to learn how to use wireframing applications to create mockups of how your proposed system will look or work. Wireframes focus on content, user interaction and but not on internal processing. Balsamiq is a useful tool for creating wireframes quickly in brainstorming sessions and for getting immediate feedback from stakeholders. Business analysts and designers use this category of tools for creating mockups which once signed off, can be converted into actual system designs. One of the most popular Requirements management tools is Rational Requisite Pro. If you are part of a team of business analysts working on a large project, you are likely to require a more robust solution like this for managing your requirements. Requirements management tools provide the functionality of word processing along with the capability to sort and query data using a dynamic database. This makes it easy to trace requirements along with their changes and prioritize them for implementation. Requirements management tools also have features for conducting impact analysis and managing an audit trail of changes. More often than not, Business Analysts will need to share documents with team members and stakeholders. Google Docs is a very useful tool for sharing non-confidential work online; chatting and collaborating with other stakeholders on the project. The last but definitely not the least, is a software tool for preparing and delivering formal presentations. As a business analyst, you will be faced with situations where you need to communicate ideas, justify your position or deliver updates to project stakeholders. Delivering a presentation can be made easier with a presentation software like Powerpoint or Keynote. This article has listed some of the most popular software tools used by Business Analysts. A decision on which specific tools to go for would naturally depend on key factors like your unique requirements and budget. Which other application category do you think should be on this list?